The Topographic Division was created as a unit of the Surveys Branch of the Dept. of Lands in 1929. The Division’s primary responsibility was topographic surveying and providing data used for the creation of topographic maps. The Topographic Division was eliminated in 1973 during a reorganization of the Surveys and Mapping Branch. At that time, the newly created Field Operations Division was given responsibility for topographic surveying activities. 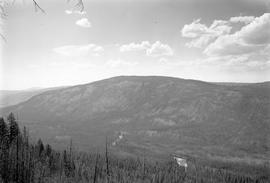 The series consists of glass plate photographic negatives generated by the Topographical Division's surveying parties operating in various parts of British Columbia between 1930 and 1946. These survey parties used photographs as a means of collecting data for topographical mapping done by the Topographic and Geographic Divisions of the Surveys Branch and, in many cases, for vertical control of aerial survey photographs. 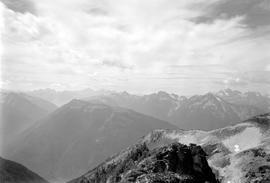 The photographs were usually taken from the summits of hills and mountains and depict surrounding landscape. The series is arranged into 70 sub-series, each comprised of the photographs generated by one survey party. Within each sub-series, the survey party's arrangement and original numbering of items has been retained. This arrangement and numbering is based on the original packaging of the photographs into small boxes of plates. The name of the surveyor heading each party is noted in the description of each individual sub-series. Selected items available in electronic form. No access restrictions. Conservation restriction: when available, use digital copy. Copyright belongs to the Government of British Columbia. File list available. Selected items, and item descriptions, are available on BC Archives visual records database. See GR-3750 for indexes to these records. A folio of maps, many containing annotations to indicate where photographs from a number of individual surveys were taken, is available in container 932492-0001. For surveys before 1930, see Surveys Branch photo-topographical negatives, ID number GR-3427. For prints taken from the negatives, see photo-topographical images, ID number GR-3478. This series was also accessioned under the number VR199003-003. Archives code(s): For a full list of the sub-series that form this series, and for the locations of the records, see: photo topographical survey records series description project draft finding aid. This finding aid is available in the BC Archives photo reference room. ; Previously known as series AAAA0067.